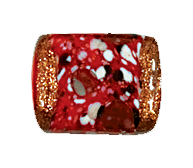 These handmade glass beads are rectangular with the hole running from side to side. Deviations in color and/or coatings are unavoidable and are to be expected. They are made in the Czech Republic.